Bernie Sanders held a rally in Middlebury on Labor Day drawing hundreds. 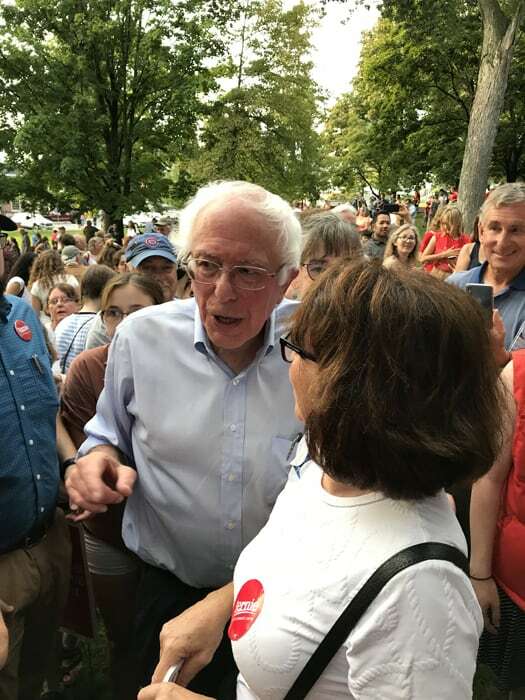 MIDDLEBURY—About 500 crowded onto the Middlebury Green to hear Senator Bernie Sanders and friends speak about labor issues, education, health and child care, discrimination, and the importance of the upcoming elections in Vermont and the nation. The annual Labor Day Rally in Middlebury followed a similar rally in White River Junction and annual AFL-CIO breakfast in New Hampshire. Sanders criticized Jeff Bezos the CEO of Amazon, whose “wealth is increasing by $250 million every single day, while he pays thousands of his workers wages that are so low that they are forced to go on food stamps, Medicaid, and subsidized housing,” Sanders said. Other Vermont Democrats included Rep. Peter Welch, Lt. Gov. Dave Zuckerman, and Democratic gubernatorial candidate Christine Hallquist who also shared an economic message. “The working class hasn’t received a real raise since the early ‘80s. When I talk about economic growth, I’m talking about focusing on the bottom 20 percent of the economic ladder,” Hallquist said. Senatorial candidate Ruth Hardy of Addison County, who is the executive director of Emerge VT, said the number of days waiting due to no health insurance has cost many Vermonters their health. Rep. Peter Welch shared his experience in a Guatemalan village when widows were fleeing with their children after their daughters’ lives were threatened. He also witnessed the immigrant family separation at our border and the trauma it’s causing refugees and asylum seekers. “It’s now a crime in America for one needing help to ask for the help they need,” he said. Lt. Gov. David Zuckerman encouraged voters to leave their cynicism and complacency behind in this critical election. “Don’t take Vermont for granted,” he said.